Why are we in Afghanistan…Is it for the $$$?….An Editorial….. I did a post on that story months ago…. The resources in the ground ARe worth trillions of dollars….. The British and American’s are right behind them…..
Why bring this up on the front page of the New York Times today? I seem to remember a post I did just a day or two ago about a certain general asking out loud for more time to prosecute the Afghan war….. I then remember writing about anti-war stirrings…. Coincidently, the fact that the place is literally sitting on a money mine pops up? From Ole’ Christopher Columbus to today……. The US is down to 500 troops in Haiti……. As the US winds down…..The UN and other nations pick up the slack….. I did mention that the US would have troops in this country for a long time….. The plan still is the US to lend military support for certain civilian missions…..but nevertheless …..
Hopefully the other nations of the world can help those country rebuild its infrastructure more sturdily….. 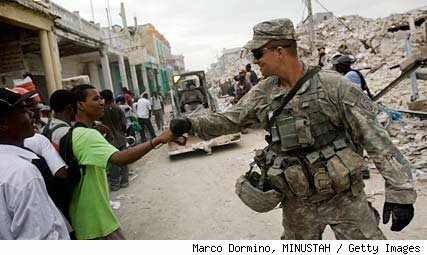 Most U.S. troops deployed to Haiti since January’s catastrophic earthquake were set to pull out Tuesday, leaving United Nations forces and civilian aid organizations to help rebuild the battered island nation. The June 1 departure, which was agreed upon months ago by the U.S. and Haitian governments, was a sign the country has “reached a basic level of sustainment,” State Department spokesman P.J. Crowley told The Wall Street Journal. “The military played an essential short-term role, but now this is getting back to where the focus is on development, and that expertise rests in the civilian sector,” Crowley said. Gates angers gay activists with a call to Congress to hold up on Don't Ask…Don't Tell…..
House Speaker Nancy Pelosi has proposed that Congress forbid the Military from expelling any service member while the Pentagon studies getting rid of the Clinton era policy…..
Defense Secretary i has sent a letter to the House Armed Services Committee against the move….. Which has angered gay activists….. In a letter Friday to the House Armed Services Committee, Defense Secretary Robert Gates and Chairman of the Joint Chiefs of Staff Adm. Mike Mullen said forcing policy changes on the military before it’s ready would be a mistake, The Associated Pressreported. “Our military must be afforded the opportunity to inform us of their concerns, insights and suggestions if we are to carry out this change successfully,” Gates and Mullen wrote to the committee’s chairman, Rep. Ike Skelton (D-Mo). Gates has said he supports repealing the 1993 law, known as “don’t ask, don’t tell.” He has ordered a study that will investigate if housing arrangements should be changed and whether gay partners would be allowed military benefits. It is due in December. If Congress acts before then, “it would send a very damaging message to our men and women in uniform that in essence their views, concerns and perspectives do not matter,” he and Mullen wrote. Gay rights advocates were quick to protest Friday’s letter. Gates angers gay activists with a call to Congress to hold up on Don’t Ask…Don’t Tell….. The Marines in Afghanistan are doing it 'Their' way…..
Everyone from the White House down was happy to get the Marines in on the surge in Afghanistan…. Because they are self-contained they were able to deploy to Afghanistan in a hurry and have been the spearhead of the operation to take back the Taliban infested Marja region…..
Not the Army bosses that have the responsibility of running the war in that country….. In fact…they have run into a roadblock…..
Because the Marines have done their own thing..taking everything with them….and operating with mostly their own…..they have put General McChystal in a bit of a jam….. So a lot of people are scratching their heads…and the Marines just keep doing their thing…. ……so lets see if someone doesn’t get the horn and issues some new orders? Or do they get the go ahead to continue to do their thing? U.S. Marine commanders have a different view of the dusty, desolate landscape that surrounds Delaram. They see controlling this corner of remote Nimruz province as essential to promoting economic development and defending the more populated parts of southern Afghanistan. The Marines are constructing a vast base on the outskirts of town that will have two airstrips, an advanced combat hospital, a post office, a large convenience store and rows of housing trailers stretching as far as the eye can see. By this summer, more than 3,000 Marines — one-tenth of the additional troops authorized by President Obama in December — will be based here. With Obama’s July 2011 deadline to begin reducing U.S. forces looming over the horizon, the Marines have opted to wage the war in their own way. The Marines are pushing into previously ignored Taliban enclaves. They have set up a first-of-its-kind school to train police officers. They have brought in a Muslim chaplain to pray with local mullahs and deployed teams of female Marines to reach out to Afghan women. The Marine approach — creative, aggressive and, at times, unorthodox — has won many admirers within the military. 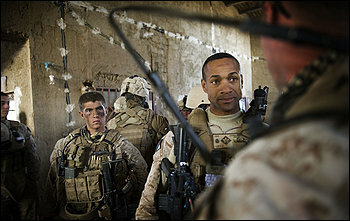 The Marine emphasis on patrolling by foot and interacting with the population, which has helped to turn former insurgent strongholds along the Helmand River valley into reasonably stable communities with thriving bazaars and functioning schools, is hailed as a model of how U.S. forces should implement counterinsurgency strategy. But the Marines’ methods, and their insistence that they be given a degree of autonomy not afforded to U.S. Army units, also have riled many up the chain of command in Kabul and Washington, prompting some to refer to their area of operations in the south as “Marineistan.” They regard the expansion in Delaram and beyond as contrary to the population-centric approach embraced by Gen. Stanley A. McChrystal, the U.S. and NATO commander in Afghanistan, and they are seeking to impose more control over the Marines. The U.S. ambassador in Kabul, Karl W. Eikenberry, recently noted that the international security force in Afghanistan feels as if it comprises 42 nations instead of 41 because the Marines act so independently from other U.S. forces. “We have better operational coherence with virtually all of our NATO allies than we have with the U.S. Marine Corps,” said a senior Obama administration official involved in Afghanistan policy. Some senior officials at the White House, at the Pentagon and in McChrystal’s headquarters would rather have many of the 20,000 Marines who will be in Afghanistan by summer deploy around Kandahar, the country’s second-largest city, to assist in a U.S. campaign to wrest the area from Taliban control instead of concentrating in neighboring Helmand province and points west. According to an analysis conducted by the National Security Council, fewer than 1 percent of the country’s population lives in the Marine area of operations. They question whether a large operation that began last month to flush the Taliban out of Marja, a poor farming community in central Helmand, is the best use of Marine resources. Although it has unfolded with fewer than expected casualties and helped to generate a perception of momentum in the U.S.-led military campaign, the mission probably will tie up two Marine battalions and hundreds of Afghan security forces until the summer. The Marines in Afghanistan are doing it ‘Their’ way…..